A number of Salt Lake City artists call 530 West 700 South their home. Brad Slaugh, who created the space, calls it Poor Yorick Studios. It’s about the skull, right? Painters will have their skulls. Or perhaps it references artists playing the part of the jester, the fringe, the one able to mask the truth behind clever words. Whatever Brad Slaugh had in mindwhen he started fleshing out Poor Yorick studios, he must be pleased with his vision made real. After sitting on Artspace’s waiting list for years, and then subletting, sharing, and losing a space on 4th North, he must have been feeling much on the fringe. Now he has completed the Herculean task of converting a former manufacturing warehouse into studios by framing it into workable spaces, updating wiring and heating, and installing lights and skylights. After months of work, nearly a score of studios is finished – and filled — and Slaugh can go back to his other job: painting. Slaugh’s large studio/office is already nearly filled, floor to ceiling, with charcoal and pastel drawings of wobbly, energetic characters. This is how his paintings begin – as blind drawings from life or from a photo, in order to limit his feedback, his editor, and allow him to suspend his disbelief while making a drawing. He likes to see it as playing a game instead of coming in with a preconceived notion. Like a musician in a trance. 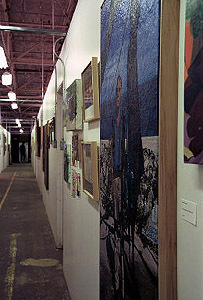 Like his daughter’s drawings, which also appear in the studio. He not only does a blind contour drawing but does the shading blind as well, sometimes making drawings that grow six or eight feet tall. What comes of it is a crap shoot, but Brad has been doing this for so long that he now has an extensive and rich cast of people and dogs waiting on his walls. Slaugh has done enormous murals of family gatherings. They take place in city parks, storage units, or in a dining room with fake paneling on the walls. The full-colored figures are distorted, sometimes grotesque. Perspective jumps in and out at the viewer. There is a lot to take in, not only in the narrative of the painting, but in the ways in which distortion fools with the viewer’s eye and emotions. 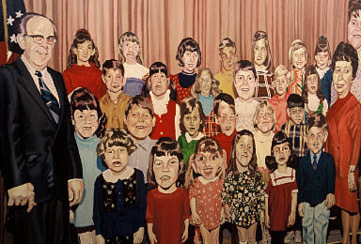 A good example is a piece Slaugh did after a grade school class portrait. Did girls really look like Martians? Did the teacher really have a gigantic head? Did the principal look like a mortician? If most of us drift back in our memories of grade school, the answer is: “Yes.” Slaugh has gotten it right. Visiting some of the younger artist’s studios can be like going into a teenager’s bedroom that is full of the unedited collection of everything they have been about from childhood on. You get a look at all their phases, corny through self-aware and back again. In the case of the bedroom, it might contain stuffed animals, baseball cards, ravaged Barbie dolls, Nirvana posters, Mad Magazines, and finally beer bottles – all in the same bedroom. In the artist’s studio there might be tentative figure studies, tenuous landscapes, nice figure studies, confident landscapes, abstract pieces, landscapes which become more abstract, and paintings which have been sanded down to the point of being abstract. It’s a pleasure to sort through these collections. It’s telling about a person that they could have reached such facility in a few short years, already messed with it, then moved back towards a suitable hybrid. 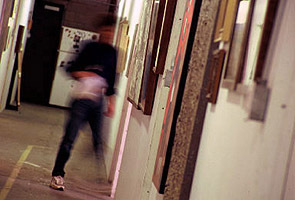 Down the hallway from Mark England is Steve Larson, who shares a studio with Jason Jones. Jones wasn’t in so we couldn’t sort through his stuff. When we visited Larson was photographing a large, raw, abstract painting on an unfinished scavenged board with added fabric texture. Larson says he goes through the same visual concepts in abstract pieces as he does representational pieces. He likes doing both, but he especially likes trying to get in between the two, getting more at the energy of the subject. When he doesn’t paint from life, he doesn’t use photos but instead “half references and half conjures.” He has done some interesting pieces of the neighborhood around Poor Yorick and lately he seems to be getting at the “in between” he favors. Larson shows at the Avenues Art Center and he and Jones have some pieces up at Glendinning Gallery through November 28. Down the hall is Chris Thornock. In his very orderly studio hang images of children in landscapes, and a few straight landscapes. The models are the most patient models he can get, his children. What is most striking about Thornock’s images is the way he paints skin. He says that, because the part of his work that interests him most is the narrative, the act of applying paint can often be boring. So he does things “to treat himself” like doing a great ear, a closed eyelid, or a bare- chested boy where he can concentrate on the different color of skin tones from transparent blue all the way to tan. 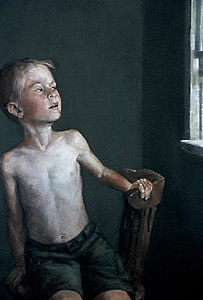 He admires Eakins and Wyeth and he feels that his paintings have a distinct American feel. Jason Wheatley only had one or two paintings in his studio, having sent the rest of them off to galleries in San Francisco and Palm Desert. Wheatley can be monosyllabic. It’s difficult to drag much out of him, but one only need look at his paintings to see what his consciousness is crowded with: pelicans, pigeons, fish, dogs, shrines, vases, cymbals, lemons, cages, parasols, monkeys, lilies, and statues of Jesus. His compositions are jammed with crisp, clean, well-rendered, photo-real objects in luxurious colors within a highly glazed surface. I asked him if gallery owners ever encourage him to paint one image, or group of images, because they sell better. No, he said, even when gallery owners tell him to lay off the monkeys because monkeys aren’t selling very well, he paints more monkeys and they sell anyway. One woman did return a painting after she discovered within it that Jesus was holding a parasol. Wheatley sets up elaborate still lifes and augments that with manipulated photographs. I asked him if one of the photos of a dog riding a bicycle, behind a monkey on a tricycle, was manipulated and he said, “The dog was really on the bicycle, and the monkey was really on the tricycle, but not all at the same time.” Wheatley has a show in New York in May. He will be fooling around with a little more chaos in his surfaces in the future, working with a more “lost and found” approach. Sri Zeno Whipple (hippie parents) is a newcomer to the studio, in fact most of his paintings had to be viewed at Sargeant Salon in Exchange Place. There is a series of alarming heads – the same large, loosely painted male (that looks like a female) head. One of them is the least resolved of the three, and the face is still. The next is further resolved and the face looks to be screaming. The third is the most resolved but the paint has been smeared quickly back and forth to give it the impression of movement, as if he is wildly shaking his head back and forth. He also has a series of still lifes which are careful, realist paintings of pears, cups, and flowers, and which seem to have been painted by a different painter than the one of the scary heads. One in particular is a study in grey and white of an onion. It’s so bereft of color that it could almost be a black and white painting, but then there is just the barest hint of green from the garden, visible through a thin, thin, layer of onion skin. This is a fraction of the artists at Poor Yorick. The others currently on the roster are Trent Alvey, Joey Behrens, David Laub, Tom Mulder, Ryan Peterson, Alex Ferguson, Tracy Strauss, Ben Duke, Tessa Lindsey, Jeff Clark, Trent Call, and Zachary Proctor. If you would like to visit the gallery call Brad Slaugh at 759-8681, or just pop in and decide for yourself whither lies the infinite jest.